Nokia 230 Dual SIM is a new device that shows Microsoft is not done yet with the release of feature phones following its takeover of Nokia’s mobile business. The dual-SIM phone is designed to appeal to selfie lovers with a decent front-facing camera featuring LED flash. Although featuring a polycarbonate chassis, Nokia 230 Dual SIM looks attractive with its sand-blasted aluminium rear cover. The build quality is reliable and Microsoft says it has a ‘thin profile,’ but that is left to you to agree with considering a device thickness of 10.9 millimetres. The feature phone sports a 2.8-inch display which is based on LCD Transmissive technology. The screen has a QVGA resolution of 320 x 240 pixels. A key selling point of the Nokia 230 Dual SIM is its 2-megapixel front-facing camera with LED flash which should make for impressive selfie taking even in low-light conditions. A dedicated camera key for selfie capturing makes it truly a snap to capture self-portraits to easily share with friends using apps such as Facebook and Twitter. There is also another 2-megapixel fixed-focus snapper with LED flash and 2x digital zoom on the rear for some decent shots. The size of onboard storage memory on Nokia 230 Dual SIM is not exactly clear, but it wouldn’t be surprising if it is just few MBs that we commonly see on feature phones. Expandable storage of up to 32 GB is supported via the microSD card slot, however. Connectivity options on the phone include microUSB 1.1, Bluetooth 3.0 with A2DP and EDGE/GPRS. As its name already indicates, Nokia 230 Dual SIM comes with dual-SIM slots that let you use two SIM cards side-by-side on the device. It is accompanied by a 1200mAh battery which users will be able to replace when it is no longer serving up enough juice. The juicer is expected to support talk time of up to 23 hours and a maximum music playback time of 52 hours. Nokia 230 Dual SIM is not yet available in Nigeria. When available, you can buy it at leading online stores in the country. 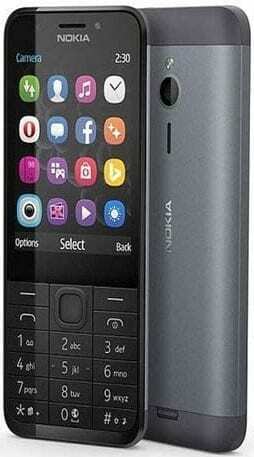 Nokia 230 Dual SIM Price in Nigeria is expected to range from N9,000 to N12,000 depending on your location in Nigeria.